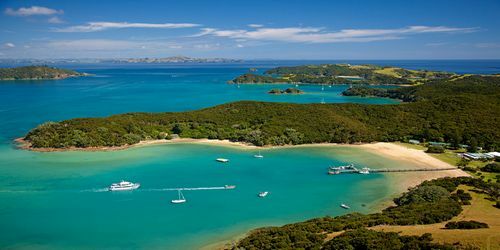 Take part in the Bay of Islands most famous cruise. The “Cream Trip" began in 1927 and remains a popular cruise with tourists today. 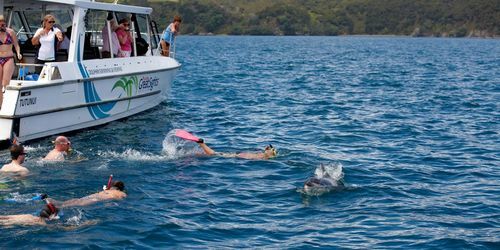 You will have a full Day in the Bay including dolphin encounters and swimming ( additional fees apply), discovering the Hole in the Rock, delivering mail, boom netting, Island stopover for lunch and learning the history of the Bay of Islands through informative and interactive commentary. Get up close to view and swim with Dolphins in their natural environment in New Zealand's warmest waters. Travel on our purpose built 35 seat intimate vessel with an experienced passionate crew which will get you as close as possible to these amazing creatures. Swim is included and wetsuit, snorkel and mask are supplied. Terms and conditions apply. Experience the Bay by land and sea with this unique cruise and tour experience, encompassing history and nature as well as some treats. 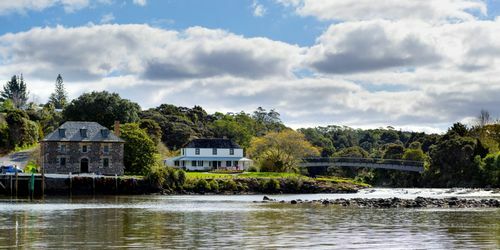 Cruise the Bay on board Island Adventurer before exploring historic Kerikeri's many charms. This tour by both land and sea includes entry into the Stone Store and Kemp House and ends with wine tasting at Ake Ake Vineyard. This tour allows you to get close and personal with the Islands of Ipipiri. Cruise to the back of Roberton island and explore the caves, the entrances to the lagoons and sheers cliffs of these beautiful Islands. If you love the outdoors and seeing nature at its finest, then this tour is for you. The Bay of Islands region contains 144 islands, many with fantastic walking and snorkelling opportunities. Island Adventurer can get you to these pristine spots. This walking adventure will give you opportunity to walk on two of the islands, landing directly on the beach, where no wharf exists. Passionate about fishing as Ken is, or just would like to try a new experience, we can assist you in booking a fishing trip in what is recognised as a world class fishing destination. Paihia Wharf, only a 3 minute walk from the motel, is the pick up place for charter operators. For a unique experience, join a group for a guided sea kayaking adventure or hire a sea kayak to explore the local islands at your own pace. Exciting day sailing and scenic tour of the Bay of Islands on a go-fast 65 foot ocean yacht. Enjoy breathtaking aerial views of the Bay of Islands from New Zealand’s highest parasail at 1200ft. Tours depart from Paihia Wharf. Experience a working tall ship with her own unique history. Help set the sails or take the helm. Climb the rigging or climb out on the bowsprit and ride the waves. Or just relax! 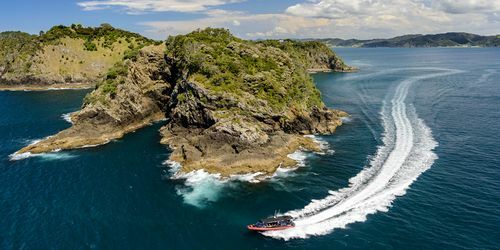 A choice of aeroplane or helicopter scenic flights offering you a unique and memorable experience of the Bay of Islands and Northland with spectacular coastline view and island scenery. Explore the underwater wonders of the Bay of Islands - plenty of wildlife and historical shipwrecks, Rainbow Warrior and HMNZS Canterbury. Never dived but now keen? Here is your opportunity to do a dive course. Take a water taxi and explore some of the most beautiful islands – ideal for a day trip. Enjoy a leisurely 2 ½ hour evening cruise up the Waitangi River to the gorgeous Haruru Falls. Or perhaps a lunch cruise from Paihia to Russell. 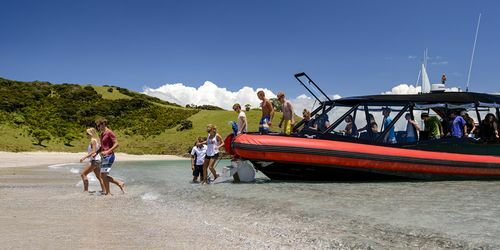 Cruise and explore the mangrove forest, then meander up the Waitangi River to the Haruru Waterfall. An interactive Waka experience providing a rare and unique insight into Ngapuhi tribe’s ancient customs, rituals and traditions. Histories and stories shared with you as you paddle a 40ft Waka Taua (War Canoe) together on the tidal estuaries of the Waitangi River. 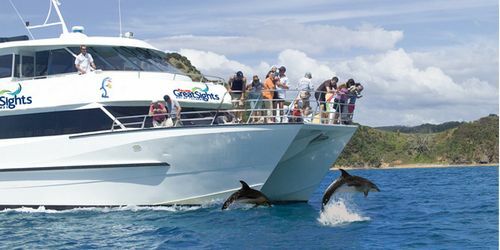 Sailing adventure on a 50 catamaran and encounter and swim with the dolphins.